Get outdoors at Aurinkolahti Beach and Tapiola Golf. Get a sense of the local culture at Seurasaari Island and Open-Air Museum and Natural History Museum (Luonnontieteellinen Museo). There's still lots to do: admire the masterpieces at Kansallisgalleria, test your problem-solving skills at popular escape rooms, take a stroll through Ullanlinna, and indulge your thirst for a good beer at Stadin Panimo. Pune, India to Helsinki is an approximately 13-hour flight. You can also do a combination of flight and ferry; or do a combination of flight and train. The time zone difference moving from India Standard Time (IST) to Eastern European Time (EET) is minus 3 hours. In February, daily temperatures in Helsinki can reach 0°C, while at night they dip to -3°C. Wrap up your sightseeing on the 21st (Thu) early enough to travel to Kemi. Kemi is a town and municipality of Finland. On the 22nd (Fri), explore the world behind art at Kemin Jalokivigalleria (Kemi Gemstone Gallery), then take in the spiritual surroundings of Kemi Church, and then pause for some serene contemplation at Tornio Church. For ratings, other places to visit, where to stay, and other tourist information, use the Kemi travel planner. You can fly from Helsinki to Kemi in 4.5 hours. Other options are to do a combination of flight and train; or drive. Traveling from Helsinki in February, things will get a bit cooler in Kemi: highs are around -4°C and lows about -11°C. Finish your sightseeing early on the 22nd (Fri) so you can take a train to Rovaniemi. Kick off your visit on the 23rd (Sat): see exotic creatures in open habitats at a safari tour, explore the fascinating underground world of Syvasenvaara Fell, then get engrossed in the history at Rovaniemi Local History Museum, and finally stop by Your Piece Of Finland. 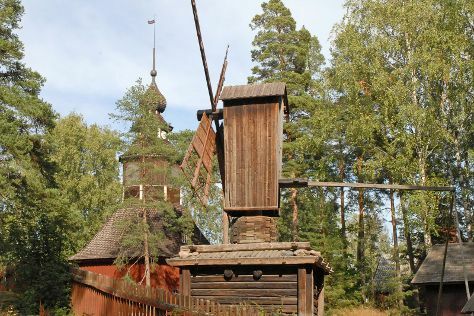 On your second day here, tour the pleasant surroundings at Ounasvaaran Hiihtokeskus Oy, get engrossed in the history at Arktikum, and then stroll the grounds of German Soldier s Cemetery. To see photos, more things to do, other places to visit, and more tourist information, refer to the Rovaniemi holiday planner. You can take a train from Kemi to Rovaniemi in 1.5 hours. Alternatively, you can take a bus; or drive. Expect a daytime high around -6°C in February, and nighttime lows around -11°C. Finish your sightseeing early on the 24th (Sun) so you can travel back home.